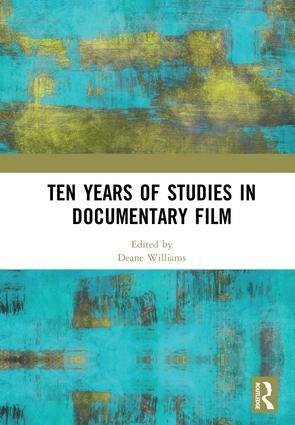 This volume will be a ‘time capsule’ of the first 10 years of Studies in Documentary Film (2007–2016), tracing not only the development of the journal but also of documentary studies in the same period. Issues such as the rise of digital documentary forms and authorship, documentary activism, and the Chinese Independent documentary, as well as diverse political issues, will be raised in the introduction and evidenced in the articles. The chapters have been chosen for the various themes they raise in documentary studies but also the broader field of documentary scholarship (including publishing), and the rise of the internet as a powerful force in documentary studies. Deane Williams is Associate Professor of Film and Screen Studies at Monash University, Melbourne, Australia. He was editor of the refereed international journal Studies in Documentary Film; and author of The Cinema of Sean Penn: In and Out of Place (2015), editor of The Grierson Effect (with Zoë Druick, 2014), and editor of Australian Film Theory and Criticism (3 vols.) (with Noel King and Con Verevis, 2013–6).